There are two options for moving text around your plans. If you are moving plans within the same week, you can use the green crosshairs (they appear when there is text entered in a box) to drag one box's content to another. You will be asked if you want to move or copy the contents to the box. 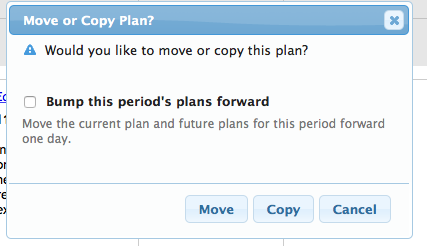 You also have the option to bump that period's plans forward. You can also use the Cubby feature to move your plans. The Cubby is especially helpful if you want to move plans from one week to the next, or even from planbook to planbook. Using the green crosshairs, drag the content you want to the Cubby tab on the far left side of your page and drop it in (the "Cubby" tab will only appear if there is content in the cubby). Once you click on the crosshairs and start dragging your plans, the "Cubby" will appear. Navigate to where you want to put the content (different week, different planbook). When you're ready to access it, click on the Cubby again and drag it out to where you want it to go. The Cubby will keep the same content in it regardless of the week or planbook that you're working on.